Solaray® Nattokinase and Serrapeptase is intended to provide nutritive support for normal, healthy blood flow and circulation. DISCUSSION: Solaray® Nattokinase and Serrapeptase is intended to provide nutritive support for normal, healthy blood flow and circulation. 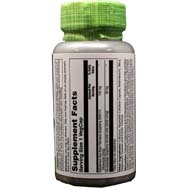 Nattokinase is a fibrinolytic enzyme extracted from the traditional Japanese food natto. Serrapeptase is a non-animal, proteolytic enzyme derived from a controlled fermentation of the bacterial strain Serratia spp. 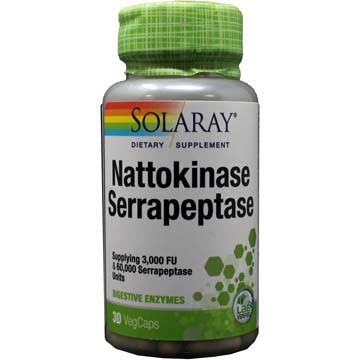 Solaray® Nattokinase and Serrapeptase is enteric coated, which helps the capsules survive the stomach acid and pass into the small intestine. 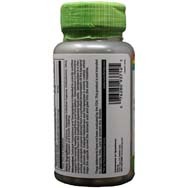 Other Ingredients: Vegetable Cellulose, Capsule, Cellulose, Maltodextrin, glyceryl Triacetata, Silica and Magnesium Stearate. Directions: Take one vegetarian capsule with a meal or glass of water.